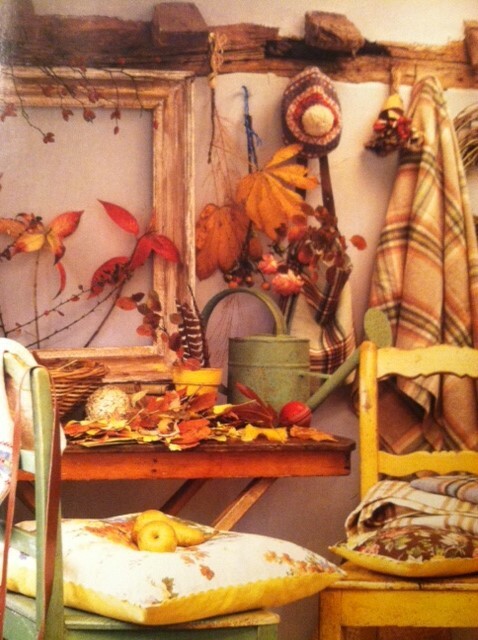 Autumn foliage and food truly captures the essence of the fall season…when homes and gardens are in their golden glory! The fiery seasonal colors of a spectacular collection of trees beyond the property turns the rich reds and burnished golds into a beacon that lights up the garden…also, speckled apples, the bronze of the late muscadine grapes, glowing red seeds of Magnolias’ sculptural pods, flaming hues of maples, the peeling bark of River Birch…colors and textures creating an ambiance that verges on the spiritual! To the organic gardener, this season is anything but dull…or finished. All those gorgeous leaves waiting to be raked and either composted or shredded for mulch and a few precious plants to be protected from an early frost. I find it to be a very busy time when I begin to tidy a bit after the summer. As to plant material, I do NOT clean up much preferring to leave seed heads for the birds! However, I do look out for decaying matter at this time of year because the damp conditions often provide a breeding ground for various plant diseases. I strive for a good balance of plant material, stones, wood, and leaves that offer a winter home for beneficial frogs, toads, praying mantis, lighting bugs, and many other various creepy crawlies. Cleaning up a bit of dead material, spreading some compost and then putting down fresh mulch is a key task right now. Dividing perennials, trimming fruit trees, and transplanting can all be done before the deeper temps of winter take hold. Working inside in the late afternoon as the sun goes down is particularly enjoyable right now…creating free-spirited “folk art”with natural materials…weaving vines and stem into handcrafted twiggy wreaths. These circles of life make excellent gifts for friends…I occasionally add walnuts and seed pods to a wreath but usually I prefer the simplicity of just a lovely plaid or check bow wired on at a jaunty angle. This type of art is always inventive and free-spirited…much like hand-turned wooden bowls, woven baskets, colorful hand-stitched quilts, and carved wooden decoys…all rich textures adding a touch of cozy seasonal warmth to a room. As I mentioned before…I do like to collect! Wishing for a spot/corner like this where I could be inspired to actually create a few of the ideas/projects I’ve been thinking about…hum-m-m…there is a space in my office…I could move some things around! Having a special place to work and create is part of the process of maintaining sanity in a bit of chaos for me…chaos of thought and wanting to do so many things and having to realize there are only so many hours in a day. When my eye is drawn to something…a leaf, a vine, a piece of an old textile or woolen blanket, an antique gold frame…my mind whirls at all the possibilities!! 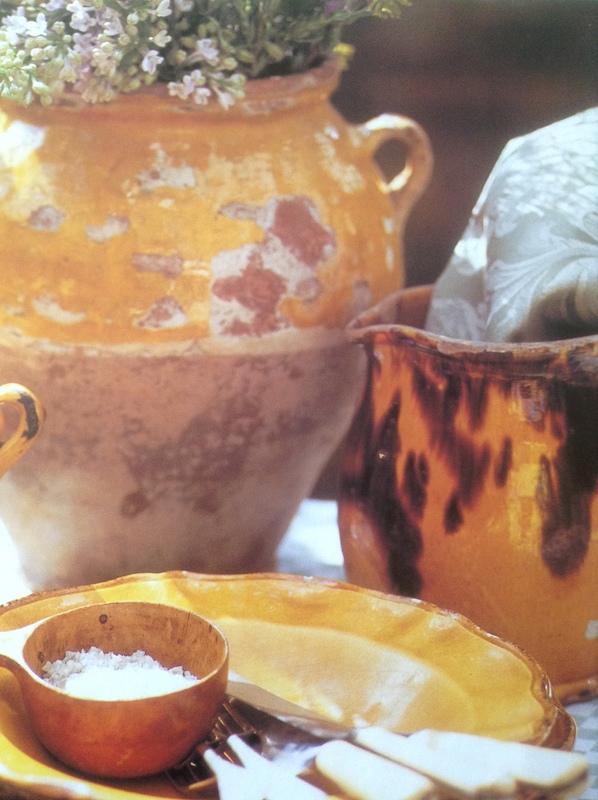 Golden yellow Provencal glaze on antique pate’ jar, pitcher and plates spell autumn and late afternoon sunsets…In France, such household pieces handed down through a family are cherished and their treasures are proudly displayed and used in every home for cooking, serving meals or just enjoying…a cracked or chipped vase, vintage lace, old copper pots, a cashmere shawl, Limoge plates, glazed jars and pitchers, market baskets, garden tools and more…part of the enjoyment is simply using beautiful old things! For the French, food and leisurely meals are a national passion, a part of the essence of the French identity…people linger over food and wine for hours. Something we could and should aspire to. Eating lovingly prepared food in a relaxed setting does much to inspire family conversation time. Meals are actually several courses of very small portions, family and guests are encouraged to eat and drink wine all while discussing topics ranging from relatives, crops, gardens, hunting, mushrooms/truffles, and chickens to politics! Menus that reflect what can be found in the region are the tradition from season to season. The last of the fall tomatoes can be used to make one of my favorite quick&easy meals…Rosemary Pizza. Topped with lots of fresh rosemary, thinly sliced tomatoes, thin shavings of dry parmigiano-reggiano on top of goat cheese and a pastry crust…these thin-crusted pizzas are as simple as a crisp autumn day. How fabulous and easy to prepare after a day walking and working outside. A glass or two of wine and then later, a cafe’ and a good book in front of the fireplace. How lovely a way to end my day. 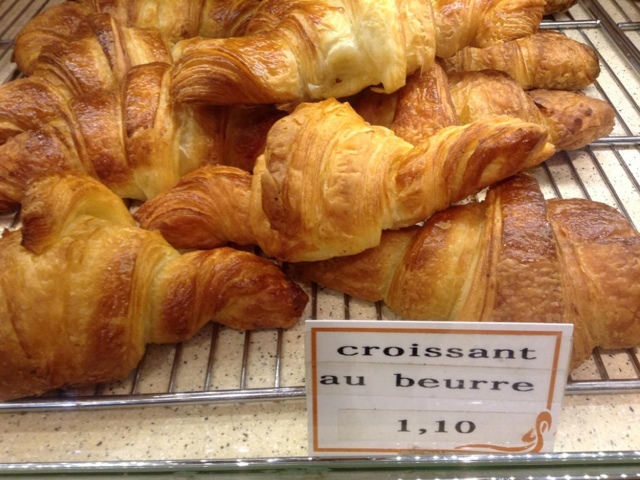 Mornings are better with croissants and cafe’ and later some soup for lunch…How smart! I once spent many hours making croissants until I realized that a few specialty bakeries can do them just as well and often even better than I could! 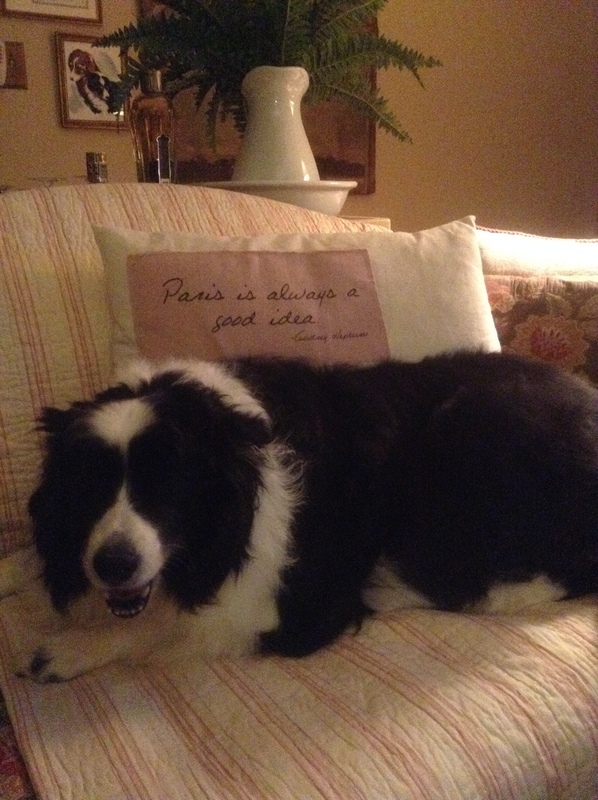 Til next time, WOOF from Holly and profiter de la beaute’ de l’automne from me, Patricia! Next Article “Tis the Season…signs of the season! Finally spring comes to my garden!